Today I had time to play with lesson 3 from my book. 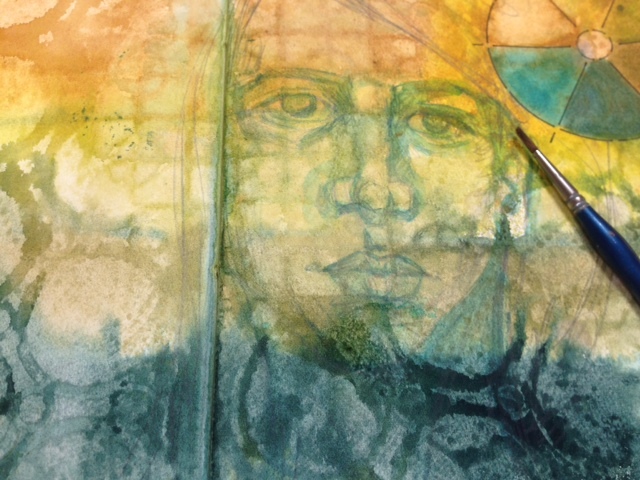 Analogous colors are so fun to play with in a messy way because you can’t make mud with them! They just keep blending and making beautiful color. 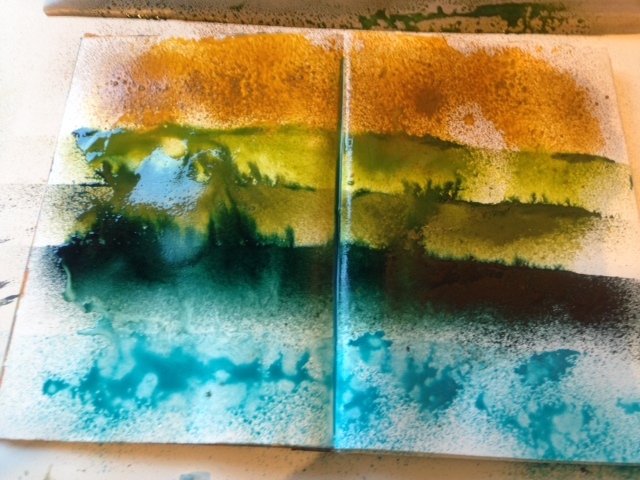 Then I used Mini Misters (Ranger) to spray some of my acrylic inks onto the page. These will be available soon at Jerrys Artarama! 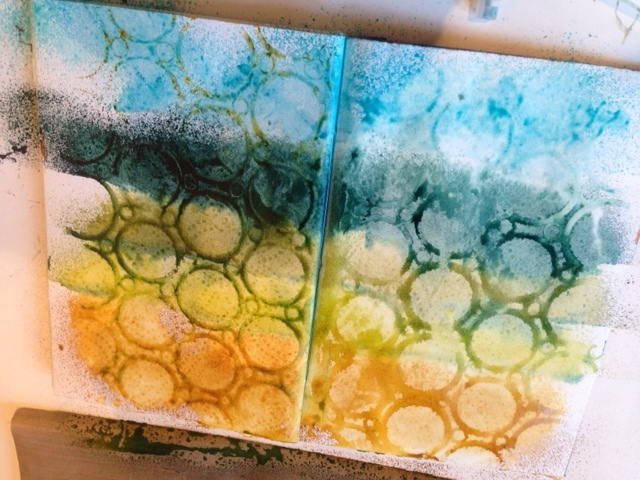 They are great for backgrounds because they’re acrylic and when dry, permanent!! No bleed through. 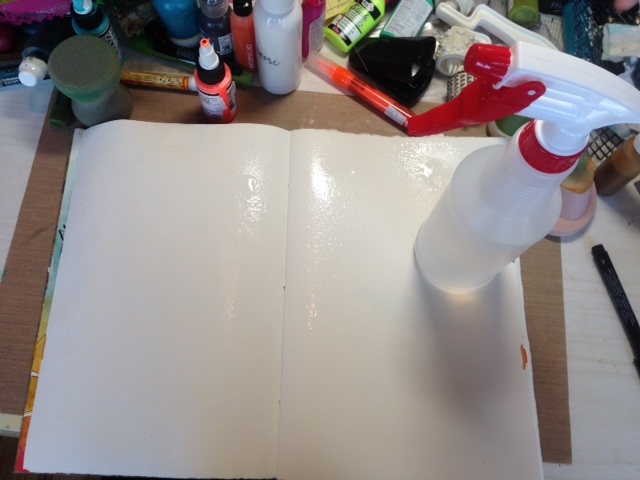 I’m using a non stick teflon sheet to mask off most of the page. These pics show the progression as I work my way up the page from the bottom. I chose to use 6 colors. Remember analogous colors are side by side on the color wheel. 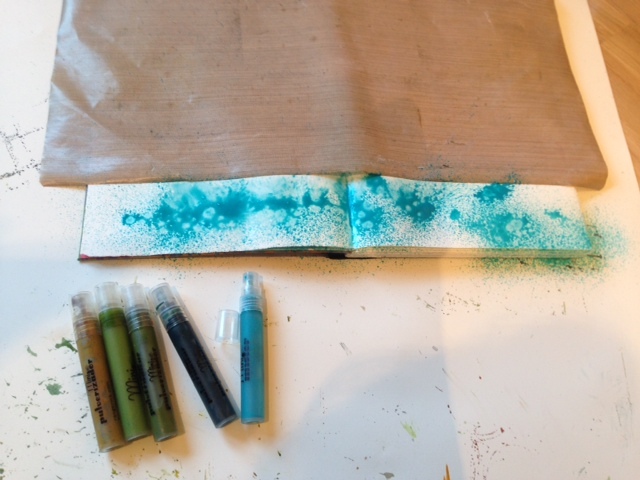 Next I laid a stencil on top (Stencil Girl Products) and then used paper towels to blot off the excess ink. I used 3 different stencils to create an interesting background. 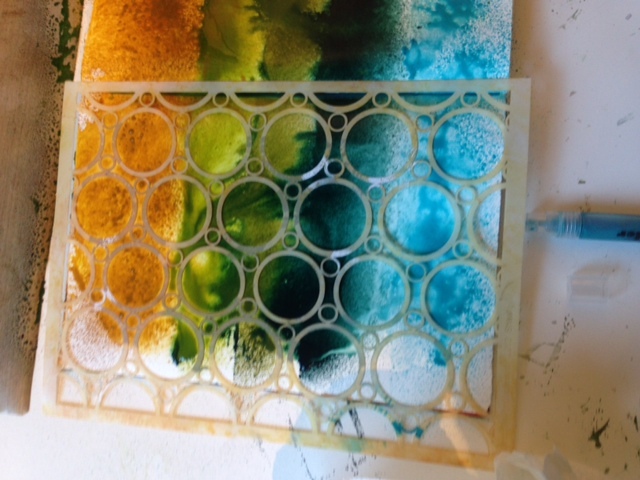 I added a color wheel using one of my stencils (Stencil Girl Products) to show the colors I used on the background. 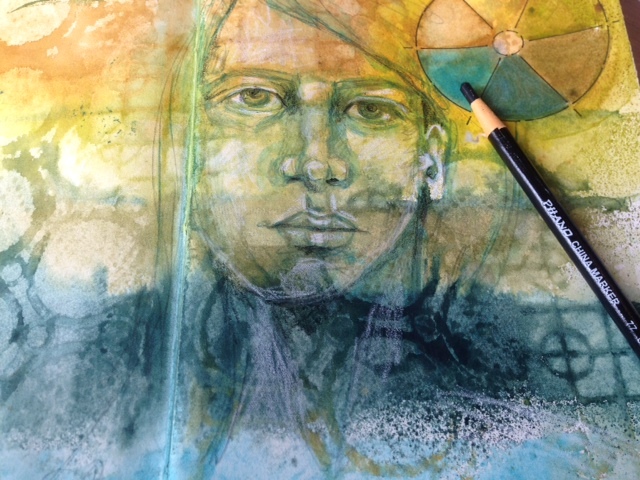 Then using a Copying Pencil (these have indelible ink in them and turn a lovely turquoise color when you wet them) and sketched a face. 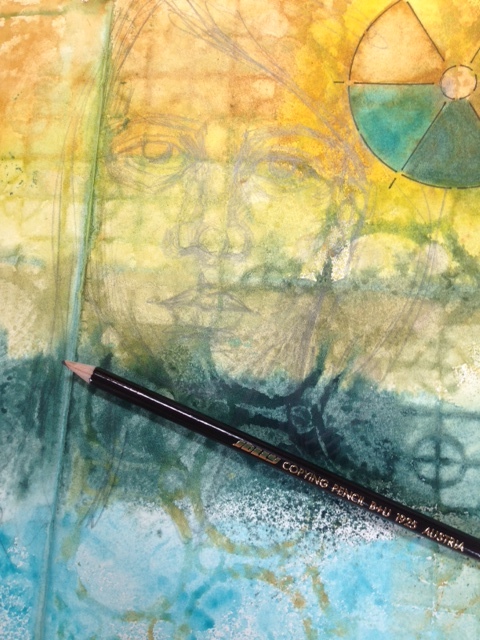 I used the Copying Pencil to stay with my color palette and not overwhelm the page. I activated the pencil with a wet brush. Next I used white and black China Markers to add a little pop to the face with highlights and shadows. I used the Copying Pencil to add some journaling and my page spread is complete. I really like that the image doesn’t overwhelm the page, or cover the background. I may work a bit more on this but I’m done for now. Hurrah, that’s what I was seeking for, what a material! present here at this weblog, thanks admin of this web page. It’s remarkable for me to have a web site, which is useful designed for my experience. Wow, that’s really awesome! I love the interest that the stencil added to the face and the background. I’ve never heard of a copying pencil, but I see that I’m going to have to get one! 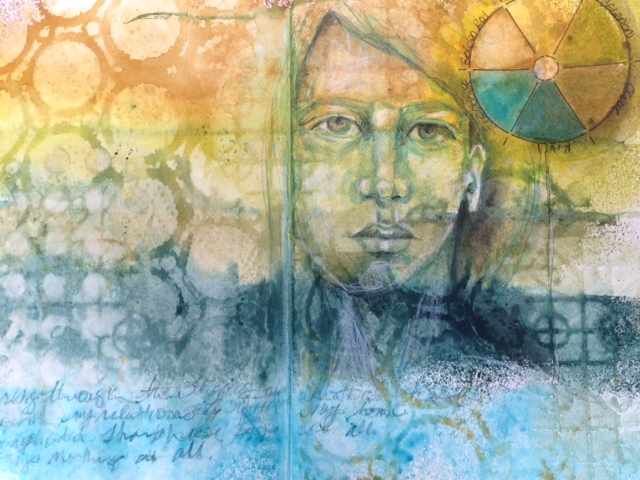 Pam, I love the use of color.. and the stencil work is wonderful. Thanks for the clarity in how you did the layers. I am always so inspired by layers. Thank you for sharing and I look forward to sitting in two of your classes at Art is – Stamford, Ct. Tonight I will really read through lesson three of your book. Thanks again. Wow, this is just lovely! I’ve stepped away from my journal a bit to take some watercolor classes and focus on sketching but this stepped out instruction makes me want to bring out my watered acrylics! 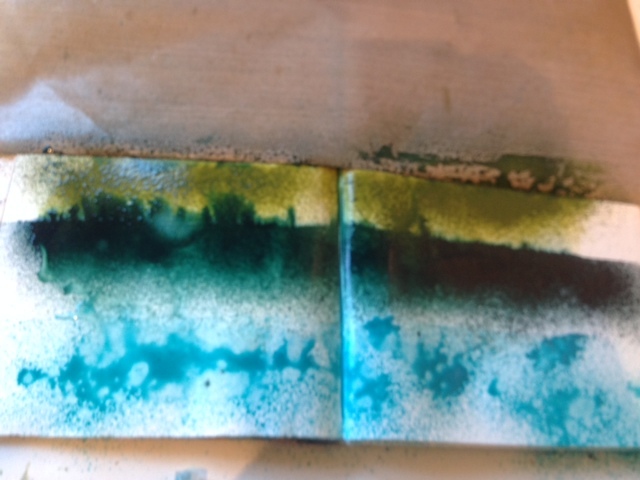 Thanks for sharing your process, Pam – this turned out beautifully! Pam, I love this page. Thank you for being such an inspiration to all us!!! Missing you and your classes at OC CREATE.